Start your holiday at the front door! For the best value for money airport service to and from the Southern Highlands, our taxi, chauffeur driven hire cars and coaches do it in a ‘no fuss’ safe and comfortable manner which gets you to the airport or cruise terminal on time! For the best value for money airport service to and from the Southern Highlands, our taxi, chauffeur driven hire cars and coaches do it in a ‘no fuss’ safe and comfortable manner which gets you to the airport on time! Pick up from your home in the Southern Highlands and dropping you off at the required domestic or international terminal … at a time requested by you. There are no car parking charges to worry about or potential damage to your car when parked at the airport. You will be driven in one of our company’s late model taxis or chauffeur driven hire cars. However, if you are travelling with 5 or more people, then we provide one of our Toyota Maxi Cabs or a luxury coach to accommodate you. The more passengers there are the less it costs per passenger. Passengers are met at Sydney Airport by a uniformed driver carrying a sign with the passenger’s name. 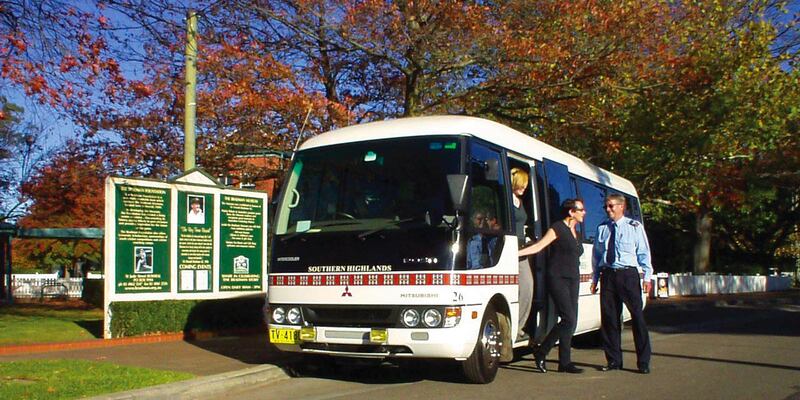 Our vehicle fleet is in radio contact throughout the Southern Highlands and the entire Sydney metropolitan area. Should you require a taxi, chauffeur driven hire car, Maxi Cab or coach for a journey to Canberra airport or to any part of Sydney or any long distance destination, then simply ask us for our price. You will be pleasantly surprised! All credit cards are welcome - a 3% administration fee applies if paid to the office or 5% if paid in car.